release of Persona. To make Persona, we built a collection tools addressing areas ranging from debugging, to localization, to dependency management, and more. This series of posts will share our learnings and tools with the community, tools which are relevant to anyone building a high availability service with Node.JS. We hope you enjoy the series, and look forward to your thoughts and contributions. We’ll start off with a topic about a nitty-gritty Node.js problem: memory leaks. We present node-memwatch – a library to help discover and isolate memory leaks in Node. You may not be worried about your increasing memory footprint, but V8 is. (V8 is the engine that Node runs on.) As leaks grow, V8 becomes increasingly aggressive about garbage collection, slowing your app down. So in Node, memory leaks hurt performance. Leaks can trigger other types of failure. Leaky code can hang on to references to limited resources. You may run out of file descriptors; you may suddenly be unable to open new database connections. Problems of this sort may emerge long before your app runs out of memory and still leave you dead in the water. Finally, sooner or later, your app will crash. And you can bet it will happen right at the moment when you’re getting popular. And then everybody will laugh and say mean things about you on Hacker News and you’ll be sad. Where’s That Dripping Sound Coming From? In the plumbing of a complex app, there are various places where leaks can occur. Closures are probably the most well-known and notorious. Because closures maintain references to things in their scope, they are common sources for leaks. Closure leaks will probably be spotted eventually if somebody’s looking for them, but in Node’s asynchronous world we generate closures all the time in the form of callbacks. If these callbacks are not handled as fast as they are created, memory allocations will build up and code that doesn’t look leaky will act leaky. That’s harder to spot. Your application could also leak due to a bug in upstream code. You may be able to track down the location in your code from where the leak is emanating, but you might just stare in bewilderment at your perfectly-written code wondering how in the world it can be leaking! After two days of bisecting, he discovered that the culprit was in the Node core: Event listeners in http.ClientRequest were not getting cleaned up. (When this was eventually fixed in Node, the patch consisted of a subtle but crucial two characters.) It was this miserable experience that made Lloyd want to write a tool to help find leaks. GCC mtrace utility to profile heap usage. Danny Coates’s v8-profiler and node-inspector provide Node bindings for the V8 profiler and a Node debugging interface using the WebKit Web Inspector. Felix Geisendörfer’s Node Memory Leak Tutorial is a short and sweet explanation of how to use the v8-profiler and node-debugger, and is presently the state-of-the-art for most Node.js memory leak debugging. We like all of these tools, but none was a perfect fit for our environment. The Web Inspector approach is fantastic for applications in development, but is difficult to use on a live deployment, especially when multiple servers and subprocess are involved in the mix. As such, it may be difficult to reproduce memory leaks that bite in long-running and heavily-loaded production environments. Tools like dtrace and libumem are truly awe-inspiring, but don’t work on all operating systems. We wanted a platform-independent debugging library requiring no instrumentation to tell us when our programs might be leaking memory, and help us find where they are leaking. So we wrote node-memwatch. useful in testing. Ok, four things. Here’s an example that shows how this data looks over time with a leaky application. The graph below is tracking memory usage over time. 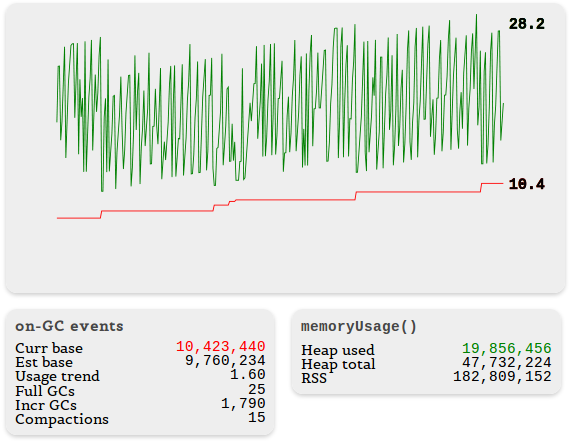 The green crazy line shows what process.memoryUsage() reports, and the red line shows the current_base reported by node_memwatch. The box on the lower-left shows additional statistics. Note that the number of incremental GCs is very high. 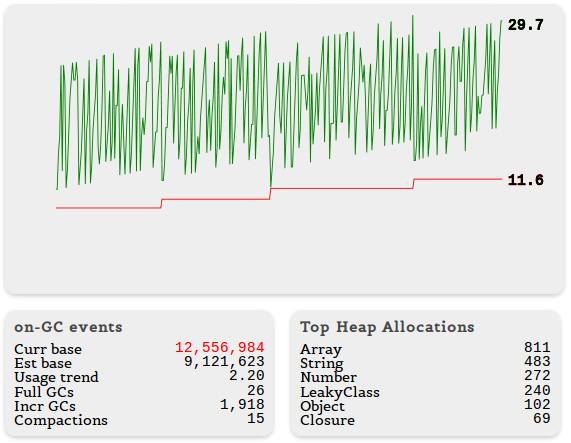 This is a warning sign that V8 is working overtime to try to clean up allocations. Finally, node-memwatch can compare snapshots of object names and allocation counts on the heap. The resulting diff can help isolate offenders. HeapDiff triggers a full GC before taking its samples, so the data won’t be full of a lot of junk. memwatch‘s event emitters will not notify of HeapDiff GC events, so you can safely put HeapDiff calls in your 'stats' handler. We want it to do more. In particular, we want node-memwatch to be able to provide some examples of a leaked object (e.g., names of variables, array indices, or closure code). We hope you’ll find node-memwatch useful in debugging leaks in your Node app, and that you’ll fork the code and help us make it better. This looks awesome. I can’t way to play around with this in my Node.JS projects. Usefull tool for debugging my node.js code ! I’ll use it right now. does this introduce an overhead? is it usable for production or only during development? With the exception of HeapDiff functionality, It is designed for production use – it only runs after gc that is performed by V8 anyway, and takes pains to perform computation fast (in c++) and not allocate any significant memory. But that said, we do not yet use it in our own persona service, though I hope to soon. Our thought isto register for ‘stats’ events and fire current_base at a monitor (we use statsd), which would give us realtime graphs of base memory usage… we currently only monitor RSS. Now the HeapDiff functionality is newer, more complex, a bit more expensive, and is still getting stabilized (see v. 0.2.0 just released). While in 0.2.0 I have higher confidence in it, I’d be more weary, and test thoroughly under load before bringing that bit into a high availability production system. That’s using d3 (http://d3js.org). The images are screenshots taken from live demos using this code: https://github.com/jedp/node-memwatch-demo. Shouldn’t the green line always touch the red line when GC happens? Hi, Felix, yes probably; but it’s doing temporal sampling to get those lines, so sometimes you get the point where the green touches the red, but most often not. Excellent article, I wonder if you guys tried https://github.com/c4milo/node-webkit-agent. If you did, I also wonder why it wasn’t useful. I love node-webkit-agent, and I use it. It’s awesome, and I can’t believe it’s not in the list above. That’s entirely my mistake, and I’ll edit this post to fix it. I personally find that the web inspector approach is a great fit for targeted digging in and bug hunting on a local machine, but less of a good fit for monitoring a long-running, live deployment of distributed servers and whatever subprocesses they might spawn. Also, I’m uncomfortable with instrumenting our production code with additional servers and hooks for an external debugger. But maybe I’m doing it wrong; do you use it for big deployments? I can imagine getting a lot out of having node-memwatch sitting there and doing long-term monitoring in the background; if it raised an alarm about a leak, it could send you an address and port number so you could dive in live with node-webkit-agent. That could be quite powerful. You are right, node-memwatch and node-webkit-agent seem to be a powerful combination. Just to clarify a bit more, node-webkit-agent does not have any extra instrumentation whatsoever, it uses the v8 internal profiler and exposes an interface to manipulate it through Webkit Devtools, that’s it. It’s very lightweight. But, as you pointed out, it does not detect memory leaks as they are happening just like node-memwatch attempts to do. It’s mostly used when a human being has noticed an odd memory behavior and wants to remotely dig in more. As for production usage, node-webkit-agent was developed to hunt a memory leak in production at BugLabs due to the lack of tools for this task. I also have heard of other people using in production deployments as well, I’m not sure how big they are though. Anyways, node-memwatch is definitely a tool worth trying in conjunction with node-webkit-agent. Nice work guys. Great post. The last few days I’ve been researching profiling tools (node-inspector no longer displays the profile tab apparently) to help track down why RSS appears to be slowly growing in my node app.. node-memwatch is now in my tool belt. Thanks, Sham Singh. Glad it’s useful! Something that will be really useful right now is a tool for nodejs, to allow us to continue profiling the memory outside of the v8 heap. I have seen cases where the memory that is continuously growing is the one outside of v8. It’s really awesome, node-memwatch is a real useful one. I am working on a very big project in which I am definitely going to use it.